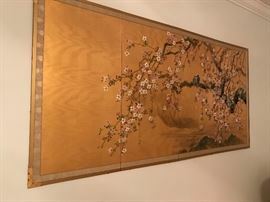 Handpainted folding screen , four panels, gilt and cherry blossoms. 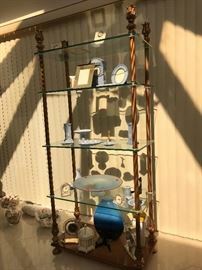 Glass shelf etagere, Wedgwood and Lenox. 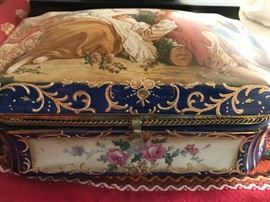 Delicate gilt and handpainted box. One of a kind handpainted French provincial dining room set. 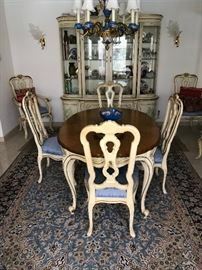 Eight chairs (table shown without leaf), four panel door, four shelf china cabinet with four bottom doors. Intricately hand painted with a delicate floral and botanical design along apron, legs, backs, doors. In the style of Galle ground glass vases. 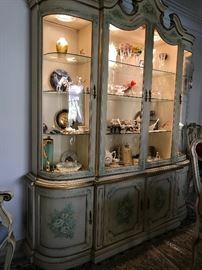 Lighted, handpainted and gilt trimmed china cabinet. Valencia, Spain. 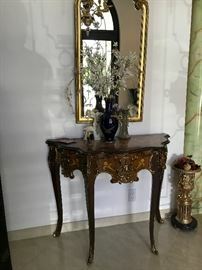 Louis XV style console table shown with tall 24kt gold painted hall mirror. 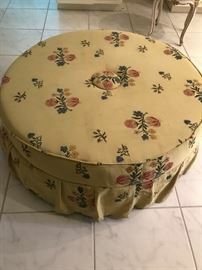 Tufted, skirted large scale round ottoman. 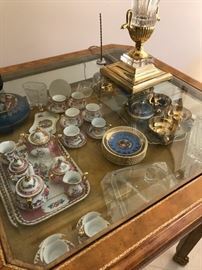 Limoges and Bavarian porcelain children's tea service shown within figural gilt and glass horizontal curio table. Waterford, Shannon and various crystal decanters and cruet sets, atop an inlaid Venetian wood round bar cart. Bespoke, custom made down sofa and settee set (a trio) in Versace red and gold. Venetian inlaid wood game table with four chairs. 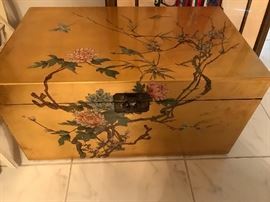 One of a pair of lingerie chest. One of a pair of mirrored, glass shelved miniature curio's/shadow boxes with door, gilt ormalu. 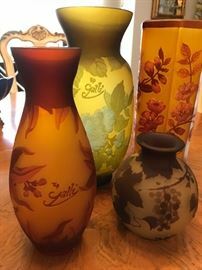 Swarovski, Royal Copenhagen, Limoges, more. Winged figural and footed curio. Breathtaking Parisian tapestry, purchased in France, with receipts. Jovan Obican, signed limited editions, lithos, proofs and originals. Romanian and European woven tapestries and traditional fabrics. 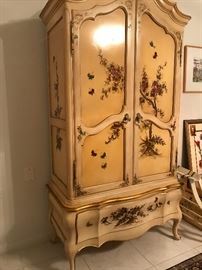 Handpainted French provincial bedroom set, with headboard, armoire, night stands, nine drawer, mirror. 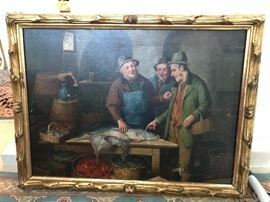 Shown in front of early 20th century Nouveau styled wool/silk Persian rug. Detail, botanical hand painted dining room set. Detail, botanical handpainted dining room set with light blue silk moire seats. Sevres style eight arm celeste blue chandelier with floral and pastoral handpainted scenes. Traditional Romanian/Eastern European cord lace. Valencia, Spain Louis XV Vernis Martin style commode with marble top. Shown with French tapestry, Christofle candlesticks, Duncan mid century teaset. Detail of incredibly fine Persian rug. Egyptian Wool multi-symbol carpet, Egyptian motif, King Darius, skulls, Arabic writing.